Polymer clay is a synthetic modeling material, not an earth clay. It is formulated from polyvinyl chloride (PVC), dyes or pigments and plasticizer to keep it soft until heat cured. It is an acrylic art material. There are many brands of polymer clay available in the United States. They have been individually tested and certified as non-toxic art materials. Brands vary in how hard or soft they feel at the beginning of use and the softer clays are more brittle when cured, and the firm clays are more durable after they are heat cured.The working properties vary between brands and become a personal choice requiring experimentation. Some brands or colors within brands contain white mineral clay that makes colors opaque. Some contain mica that gives it a shimmer and shine. All polymer clays are thermal set plastics, meaning they are hardened with heat and do not become soft again after curing. Before being cured in an oven, clays are thermally reactive and become hard when cool and soft when warm. For more information about the chemistry and history of polymer clays, click here. Is polymer clay safe to use? When used according to package directions, polymer clays are safe and fun to use. Polymer clays are extensively tested before being allowed for sale in Unites States as art supplies. You can read the Materials Safety Data Sheets (MSDS) for polymer clays online. 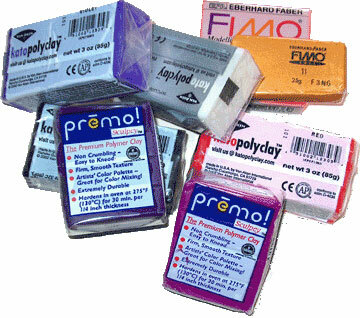 Click here for reports on FIMO, Premo and Kato Polyclay. Is polymer clay toxic or poisonous? Polymer clays are certified as non-toxic. If eaten in large quantities, intestinal blockages may occur so do not allow babies or pets unsupervised access. Normal recommended baking temperatures do not exceed 275 to 300 degrees F. The most important thing about baking polymer clays safely is do not overheat the clay. With most clays scorching will begin at temperatures just over 300ºF. Toxic fumes can occur at 390ºF. Conversely, baking at temperatures that are too low will not fully cure the clays and pieces will become crumbly over time and break. Watch for darkening or melting indicating the oven temperature is too high. As many oven thermostats are off by a number of degrees use a free-standing oven thermometer and test various areas in your oven. Some corners can be hot spots. Small toaster ovens can burn clays near the heating coils when other areas in the oven will not be hot enough to fully cure polymer clay. Convection and some electric ovens will spike while preheating. The fumes are not toxic unless the clay is burning. Keep your oven in a well-ventilated area. If you find the odor of curing clay noticeable or even unpleasant, put your oven in an isolated area. Placing the oven in a cold or drafty area may cause temperature fluctuations so watch your thermometer. Use an oven thermometer and ventilate the area where curing is done, regulate temperatures carefully. If burning occurs, turn off oven and ventilate with fans and open windows or doors. For more information, read this article on Polymer Clay Safety by Tommie Howell. Click here to read the Duke University Medical Center‘s report on hazard risk assessment from the use of polymer clay. One of the earliest forms of polymer clays was invented by Robert Bakelund as he searched for a synthetic form of shellac. Natural polymers include shellac, made from Laq beetles, tortoise shell, amber and celluloid and viscose rayon which are made from tree resins. Bakelund’s work resulted in the formulation of Bakelite. It was extremely popular with designers and had an early form of polymer clay commercially available in kits, but the phenol base of uncured Bakelite was flammable and these were discontinued. Todays clays are non flammable and certified as non-toxic art supplies. FIMO polymer clay was first made popular by Maureen “Fifi” Kruse, daughter of well known German doll designer Kathe Kruse in the early 1940s. Though the Kruse family did not invent the substance that was offered to them for use in the doll making factory, Fifi used it in making miniatures and mosaics, and it became very popular. The compound was later sold to Eberhardt-Faber in the 1960’s and they named it after her. “Fifi’s Modelliermasse” translates from German as Fifi’s modeling clay, and was shortened to “FiMo”. Where can you get polymer clay? Is it like Play-doh or Plastilina? No. Those products are not thermal set plastics. The first is a colorful salt based modeling compound sold to children, and the second is a brightly colored form of polymer modeling material that does not harden. If heated it will melt. Plastilina is used by children and by animators who do stop-frame animation work such as “The Adventures of Gumby”. 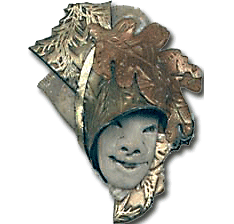 VanAken makes this material as well as Kato Polyclay, so use caution not to confuse the two. Is Friendly Plastic a polymer clay? No. Friendly Plastic is sold in colorful hard strips that can be heated and reshaped over and over. It is not a clay, but it is a polymer. Once heat set, polymer clays can not be re-heated and re-formed. What can you do with polymer clay? Beads, buttons, jewelry, sculptures, dolls, masks, mosaics, collectibles, furniture laminates, decorative items and illustrations for books and magazines can all be made using polymer clay. In creative hands, the possibilities are wide open! The exceptions are few–polymer clay should not be used in items that will be heated to over 300 degrees F, such as incense burners, smoking pipes, stove trivets, and direct heat cooking or food service items. Nor is it strong enough for industrial strength uses such as building foundations or trailer hitches on cars—but when used within common sense limitations, applications of polymer clay can be extremely varied. What is Liquid Polymer Clay and how is it used? Polymer clay is also available in a liquid form which is extremely useful for bonding raw to finished clay. Liquid polymer clay can also be used to transfer many printed images. Liquid clays include TLS (Translucent Liquid Sculpey), FIMO Decorator Gel, and Kato Liquid Polyclay. These range in degree of transparency and each can be made more transparent by curing at the correct temperature for each product, and by sanding and buffing the finished piece. Liquid clays are often used as a glaze or finish on clay surfaces. Pigments and powders can be added to create faux enamels and other effects. Sculpey Diluent is not a polymer clay, it is a liquid plasticizer which can be mixed into any of the polymer clays to soften old or hard clays. What is”conditioning” and why is it important? All polymer clays must be conditioned before using them in any project, even the clays that are already quite soft. Conditioning makes the clay more malleable and softer; it also aligns the molecules and makes it stronger. Without proper conditioning cured pieces will be fragile and brittle.To condition polymer clay by hand slice and chop the clay into small pieces. Knead and roll the clay into a snake shape, stretch it out, fold it over several times, and roll it back into a snake. Do this at least ten times. Conditioning polymer clay with a pasta machine simplifies and speeds up the process. Cut clay into approximately Â¼â€ thick slices. Roll the slices through the pasta machine on the thickest setting. Stack a couple of slices together and roll them through together. Stack these, turn them sideways, and roll them through again. Repeating this process with several slices will form a sheet of clay. Fold the sheet in half, roll this through the pasta machine inserting the folded edge first. Do this 20 to 25 times. How do you know when it is conditioned enough? One way to know how long it takes to condition polymer clay is to mix colors. Do the conditioning process with pieces of two or more colors. When the colors are fully mixed into a solid color, the clay is fully conditioned. Inversely, it is not necessary to condition clay before mixing colors or before doing a “Skinner Blend”. The mixing/blending of this color gradation technique fully conditions polymer clay. What is a millefiore cane? The term “millefiore” is Italian for “thousand flowers” and refers to the glass making technique used to create colored patterns in glass using long rods which are placed to form designs, then heated and stretched to make a “cane”. When sliced, each piece has the design intact and these slices, called “murini”can be reheated and applied to larger pieces of glass. When used with polymer clay, the colored clay is shaped and the design is put together like a puzzle to form a cane. The clay cane is not heated like glass canes, but is manipulated by stretching and compressing the clay to reduce the design in size as the cane becomes longer and thinner in diameter. Slices from these canes are used to decorate clay pieces and other objects in many ways, or can simply be cured and used as buttons, charms or mosaic tiles. The most commonly clays used in making detailed millefiore canes are FIMO Classic, Kato Polyclay and Premo. What can be done about clay that is too hard or too soft? If your clay is very hard, help soften it by using a food processor with the chopping blade. A few drops of vegetable oil can be added while using the processor. Do not pour from the bottle, as this is hard to control; instead, pour a few drops into the cap or a spoon, and add from there. Run the food processor in short bursts, and don’t leave it unattended, as the clay will heat during use. To add small amounts of oil by hand, coat your hands lightly and continue to work the clay. Or, you can add transparent clay, which is softer and adds plasticiser to hard clays. There was a product on the market called “Mix Quick” that is very helpful for softening hard clay as it contains even more of the plasticiser than the translucent clay. Another option is to add Sculpey Diluent, which is the liquid plasticister. For those with wrist or hand strength problems, or who are working with large quantities, a pasta roller machine can be used to knead the clay. This has the added advantage of rolling the clay into even sheets of adjustable thickness. If your polymer clay is too soft for your purposes it can be made more workable by wicking or leaching excess plasticizer from the clay. Roll the clay into sheets and place between two pieces of newsprint or copier paper. Leave the sheets between the paper for only a few hours. You must be able to fold the clay without any cracking along the fold. Leigh Ross recommends putting sheets of clay between paper, sitting on it for 5-10 minutes to be sure it is not leached too much. Removing too much plasticizer can significantly weaken the finished durability of the clay. For best long term results allow soft clays to stay packaged, in a cool dry place to â€œageâ€. Several months later the clay will be firmer without the loss of strength leaching can introduce. How long will it last and how do I store it? Polymer clays have a shelf life of between five and ten years if stored properly. Wrapped and stored canes made six years ago are still usable but not as pliable as they were within the first year. Storing canes in the refrigerator or freezer is not advisable as this causes the plasticizer to weep out of the surface of the canes and causes less pliability. Keep sealed blocks and bricks of clay in a cool area, out of direct sunlight. As it will begin to cure at about 120ºF, do not leave polymer clay in a vehicle on a hot day. If possible, order clay in bulk during cool months to avoid shipping raw clay in high temperatures. To eliminate dust and pet hairs from contaminating your polymer clay surfaces, use plastic wrap to cover work in progress and raw clay if you need to leave it. Use plastic wrap or sandwich bags to store cane lengths and unpackaged raw clay. Over time some plastic wraps will interact with polymer clay; Saran with Cling does not interact and that is what we use to store canes or cover works in progress. Also, as polymer clay will interact with some hard plastics, do not store raw clay in plastic containers without wrapping the clay. Deli-style parchment paper also works well between the sheets of clay as it will not leach the plasticizers, but waxed paper will cause leaching over time. Can I add other things into polymer clays before baking? Many art supplies can be added to polymer clay to create some very beautiful effects. Most of them can be used on the surface or worked into the clay. Pigments and powders can be applied to the surface of textured clay to highlight the design. Especially effective are Pearl-Ex Powders containing powdered mica. They are available in a wide range of metallic and reflective colors. When worked into the clay the powder disperses at first in a localized swirl. Then it moves throughout the entire mass as you continue to work the clay. The more translucent the clay, the more powders and other inclusions seem to float. Opalescent effects can be seen, especially when translucent clays are finished to a high sheen. Glitter, metal leaf, confetti and fibers can also be used on the surface or mixed into polymer clays. Embossing powders, alcohol dyes and stamp ink in both dye and pigment forms are all create interesting effects. These inclusions are all more apparent with translucent clays. Finding new and different supplies to add to polymer clay is another opportunity for experimentation.When working with fine powders wearing a dust mask is highly recommended, as is working in a draft-free area. How is polymer clay finished to make it shiny? Take care when cutting and forming the pieces to avoid fingerprints and other surface imperfections. Smoothing cane slices under plastic wrap is usually enough to eliminate a great deal of sanding later. Polymer clay can be sanded and buffed after baking. This will smooth the surface, and ultimately add a sheen to the finish. Translucent clays can be made almost transparent with sanding and buffing, The more translucency in a color the easier it is to buff it to a high gloss after baking. Cernit, Premo and Kato clays take a shine very easily, FIMO colors are more matted. Sanding is best done in water containing a few drops of dish washing detergent using increasingly finer grit wet-or-dry sandpapers. Buffing can be done by hand with a rough textured cloth like denim or using a buffing wheel. If dry sanding use care and a dust mask. When using power buffing tools wear protective eye-wear and keep long hair and shirt sleeves away from the wheel. When powders or foils are used in surface applications a protective coating can be added to the cured clay. Brushing a thin coating of a liquid clay on the surface of a cured piece and baking again is one solution. Other protective coatings are available. Use only water-based products with polymer clay as coatings containing solvents will react with clay over time making it tacky. Many artists use Rust-Oleum Varathane, a water based interior polyurethane. The spray version of this product is compatible with polymer clay; many aerosol finishes will later become sticky. A high gloss finish can also be formed with Future, an acrylic floor polish. There are finishing glazes manufactured specifically for polymer clay in both FIMO and Sculpey formulations. These protective coatings can be applied or blotted with a make-up sponge for a matte finish. What kinds of glues adhere best to polymer clay? What glue to use with polymer clay depends on the other surface that is being bonded to the polymer clay. White PVA (PolyVinylAcrylate) glues like SOBO and Aleene’s TackyGlue work very well when bonding clay to wood or paper. Titebond CyanoAcrylate glue is favored by many artists for attaching metal findings. Liquid polymer clays can also be used to bond clay to clay or other plastics. Superglues have a shorter shelf life than white glues and need to be replaced once or twice a year. Where can you go to learn more about polymer clay? There are many people all around the world using polymer clays and they share their work and information in many ways, in groups like the International Polymer Clay Association and the dozens of local guilds that are found all across America and throughout the world. In addition, there are many on-line groups and archived resources on the Internet. These include Polymer Clay Central and its message board at Delphi.com , Yahoo groups like Clay-Polymer and Polymer Clay People, Usenet newsgroups like Rec.Crafts.Polymer-Clay plus many other groups all across the Internet. Other important resources for polymer clay information include The Glass Attic, Polymer Clay Daily and Polymer Clay Notes. In addition there are more than 200 books in publication about all aspects of polymer clay use. Instruction is offered by many incredible artists throughout the world, and listings for classes can be found at Polymer Clay Workshops. Many artists also have instructional dvds for sale.